The Gillespie County Fair & Festivals Association, Inc., located in Fredericksburg, Texas, is a non-profit organization whose purpose is to encourage, instruct, and promote the education of youth in Gillespie County, TX. In addition to producing the oldest, continuously running county fair in Texas, the Gillespie County Fair & Festivals Association also promotes community and family entertainment by sponsoring annual events such as Flavors of Fredericksburg and the annual Scholarship Fest. 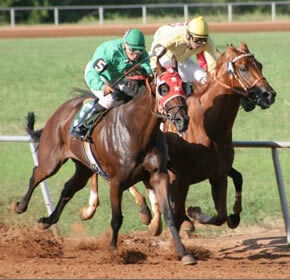 The Gillespie County Fairgrounds also sponsors live pari-mutuel horse racing during the summer as well as simulcasting races from Texas and out of state tracks. The Fairgrounds may also be leased for public and private functions.